CORVALLIS — The moment sticks in his memory. 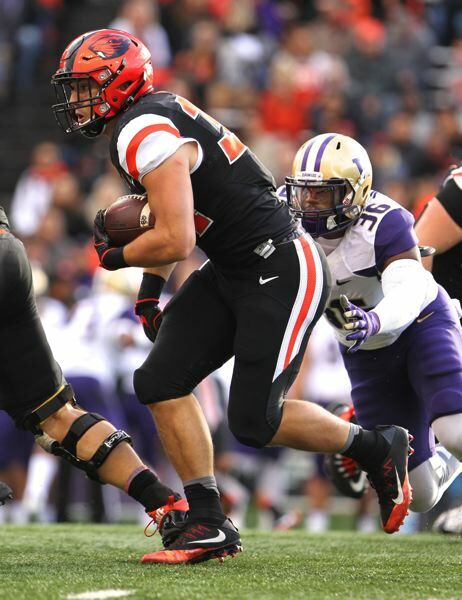 Ryan Nall will never forget Civil War 2016, when he carried the ball 31 times for 155 yards and four touchdowns in Oregon State's 34-24 victory over Oregon at Reser Stadium. "That was one of the best times of my life so far," the redshirt junior running back from Central Catholic says. "The Beavers hadn't won the Civil War since 2007. I was in middle school at the time — and I remember that game. "Being one of the main reasons we won that game is something I'll always cherish and I hope Beaver Nation will always love me for." Nall will be a major factor when Oregon State (1-10 overall, 0-8 in Pac-12 play) visits Oregon (6-5, 3-5) for a 4 p.m. Saturday game at Autzen Stadium. The Beavers haven't won there since 2007, when James Rodgers' 25-yard touchdown on a fly sweep gave them a 38-31 overtime victory. "I'd love to be a part of a win at Autzen," Nall says. "My freshman year, we almost came back (in a 52-42 loss), but time ran out. This year is going to be fun." Nall also leaves open the possibility this will be his final game as a Beaver. He is on schedule to graduate winter term with a degree in sociology. Last week, he was named to the CoSIDA Academic All-District 8 team. Nall, who has rushed for 769 yards and eight touchdowns this season, passed Bill "Earthquake" Enyart on the school career rushing list with 2,175 yards. Nall needs 59 yards to overhaul Pete Pifer and move into seventh place on the list. If he returns for his senior season, Nall would surely climb to at least fifth, behind only Ken Simonton (5,044), Jacquizz Rodgers (3,877), Yvenson Bernard (3,862) and Steven Jackson (3,625). But Nall has lost a lot of games while at Oregon State. A graduate transfer could be on his mind. For sure, he is looking to an NFL career and may opt to make himself available for the draft next spring. On both counts, Nall is noncommittal. "I have a lot of options," he says. "I have a lot of people harping in my ear. I'm just trying to finish the season out; then I'll get my body back to 100 percent. I have to talk to my parents and make a decision. All I know for sure is that I'll be graduating next term." If he returns to college football, will it be at Oregon State? That could depend on who the Beavers hire as their head coach. "I don't know," Nall says. "I haven't made any decisions. I haven't looked at anything. I'll focus on this last part of the season and (who Oregon State hires as) the new coach. When the time comes, I'll make a decision." So he might transfer to another school? "Possibly," he says. "That's why I'm graduating early, so I can have the option to do whatever I want. I'll have my degree. My plan was to graduate early enough to do whatever I want. "No decision has been made yet. I'm going to finish this season strong, rest up, talk to my parents and then make a decision." It's been a very difficult season for all involved in the Oregon State program. The team that finished with wins over Arizona and Oregon last season came in expecting to compete for a bowl berth. Instead, the Beavers have only a narrow win over FCS opponent Portland State — which finished the season 0-11. Coach Gary Andersen resigned at midseason, shocking everyone in the program. "There have been a lot of things happen this year," Nall says. "Coach 'A' departing from the team, guys getting hurt, a lot of inside things going on. … things haven't gone our way." But Nall isn't blaming the remaining coaching staff, led by interim coach Cory Hall. "Honestly, our problems boil down to execution," Nall says. "The coaches always say they're going to try to put us in the best position to win. They admit when they're wrong, and we accept that. And we admit when we're wrong, too. When we mess up on a play, it's our fault. "It has happened multiple times where the coaches in our meetings say they put us in a bad position with play calls. On the other hand, sometimes the calls are good and it's us owning to our mistakes. We know it takes the whole village for us to be successful." Nall is shocked by Oregon State's poor record. He is flustered by the Beavers' strong second halves after dismal first halves in the last two losses to Arizona and Arizona State. "My mind is boggled sometimes, because I know we have it in us to be one of the best teams in the Pac," he says. "We know we can do it, but why can't we do it in the first half? "We have one more game to showcase what we've got, and I have a good feeling we're going to do that in Eugene. We're going to lay it all on the line." Nall didn't grow up a Beaver or Duck fan. "I'd say I was neutral," he says. "Whoever was doing good, I was pulling for. When I started getting interest from Oregon State in high school is when it turned for me." Then-OSU coach Mike Riley gave Nall his first scholarship offer in the summer before his senior year at Central Catholic. "Oregon wasn't recruiting me very much," Nall says. "(The Ducks) came up for a look but never pulled the trigger, never contacted me. "I wanted to play in-state. I knew Coach Riley was a great guy — still is; I love him to death — and I committed to them that summer." Nall has had two strong games against the Ducks. As a freshman, he rushed for 174 yards and a TD on only 19 attempts. "I guess you could say I have a personal vendetta — sort of 'look what you're missing out on,' that type of thing," Nall says. "But I'm where I want to be. If I had to do it again, I'd make the same choice." After Saturday's game, Nall will have other choices to mull. If it's his last game in an OSU uniform, he'd love to go out a winner. "We have one more game to prove everybody wrong," he says. "It's the biggest game of the year. Something about the Oregon game raises the level of intensity for everybody."